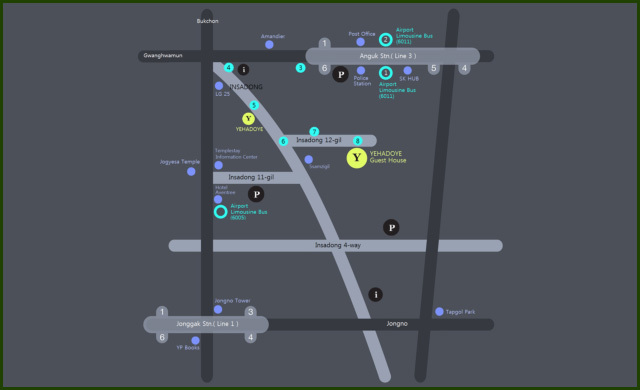 Walk 50m in opposite direction to the #6011 bus stop and find Exit 6 of Subway Line 3 (Orange), Anguk Station. Pass the exit and after another 50m, you will find the Tourist Information Center (entrance to Insa-dong). Walk down the Insa-dong main street about 150m and turn left to Insa-dong 12-gil and walk through until you find Yehadoye Guest House on your right. 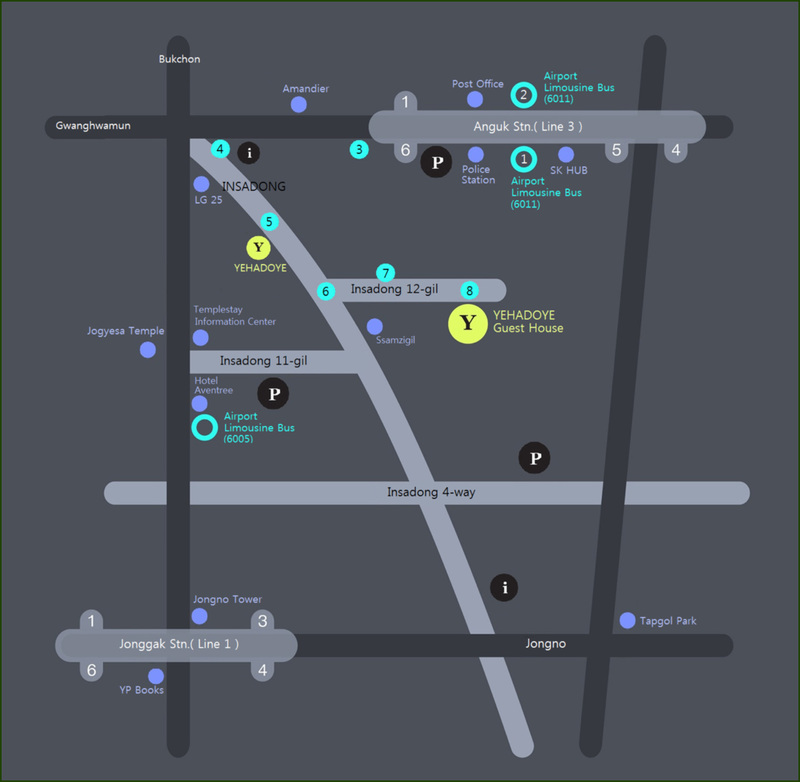 Take the Airport Bus #6011 at Incheon International Airport and get off at Angukdong station. Walk 50m to the opposite direction from the bus came in and you will encounter Anguk subway station exit #6. You can take the airport bus #6011 to Incheon Int. Airport at this stop. By Subway, take line #3 and get off at An-Guk Station. Walk out to the exit #6 and keep walking 50 meters toward the entrance of In-Sa-Dong. When entering from main strip of Insa-dong, you will find a bakery on left, 24hr convenient store on right and a tourist information booth in middle. Go 150m between two Ginko trees found on opposite side of the road, Insa-dong 12-gil will be on your left. Find street sign, INSADONG 12-GIL located in between Toh-in and Ssamjigil stores. Both 4th & 5th floors of the building are the Guest House. Go to ground floor, “Yehadoye” for check-in or information.